Share with your students ways they can be kinder at school and have them take action. Student can also keep track of their random acts of kindness through various activities. Community service projects ideas included too. 1. 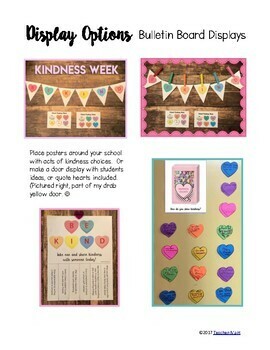 Random acts of kindness ideas for schools and service projects with links to free web resources and videos as well as display options. 2. Five different pages for recording acts of kindness completed. 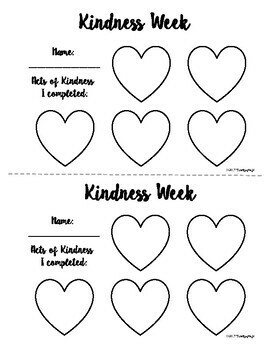 You can print colorful hearts as stickers, have students, cut and paste (black & white too), or color in hearts with actions they completed or write in their own acts of kindness completed. 4. “BE KIND” Candy Heart Pennant Banner, “Be Kind” Poster with acts of kindness suggestions to hang around the school so that students can tear-off and use, or make your own. 5. Four Bookmarks, two for World Kindness Day and two for Random Acts of Kindness Week. 8. 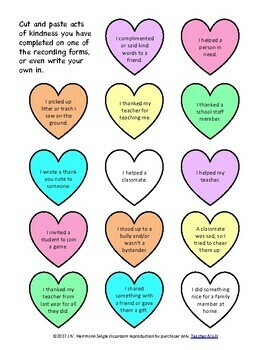 Blank hearts for students to fill out when they catch others being kind. Also they can write thank you notes, kindness quotes, ways to be kind or ideas for Random Acts of Kindness. Comes in two sizes, small and large, color or B&W, and with or without writing lines. *Important Note: I found out the color of the hearts looks different on various printers like ink jet vs. laser in case you decided to print color options. Ink jet makes the colors more pastel and true to what I see on my screen. It may vary for you too. 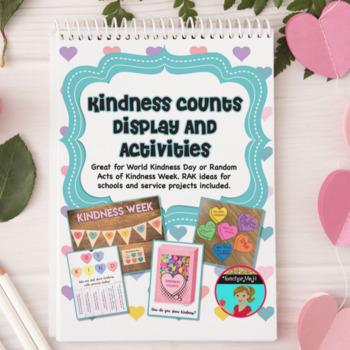 *Quick note about dates of related kindness holidays: Great for a February bulletin board or display due to Valentine's Day, Random Acts of Kindness Day (February 17th), and Random Acts of Kindness Week the 3rd week in February. (Upcoming year is Feb. 18-22th, 2019) Additional holidays you might use it for include: September 1st, International Kindness Day and November has a World Kindness Day Nov. 13th Then there is a Random Acts of Kindness Day aka RAK Friday instead of Black Friday where people opt out of shopping and sales and instead donate money and volunteer their time for charities, or complete a random act of kindness for a stranger. You might also like my other Holiday Resources many of which are free or the bundle this is part of. This download is for personal use and is licensed for one classroom only. If you want to share this content with others please buy additional licenses for only half the price. *Follow me* me on TpT to receive notifications of new FREEBIES and products at 50% off the first 48 hours.